A photo from the 250SX race shows how muddy the track was (left); 450SX rider Vann Martin’s rashes after the race (right). With rain turning its dirt course into slop in San Diego on Saturday, the Monster Energy Supercross track crew put down a chemical drying agent to curb some of the mud. But while it was meant to help make the race safer, the aftermath wasn’t pretty—riders say they have severe rashes and trashed bikes because of the substance. Motocross and Supercross website Racer X Online reported on Monday that Ken Roczen, who’s third in points for the top 450SX class, noticed the burns as soon as the race ended on Saturday, showing some people before the post-race press conference started. 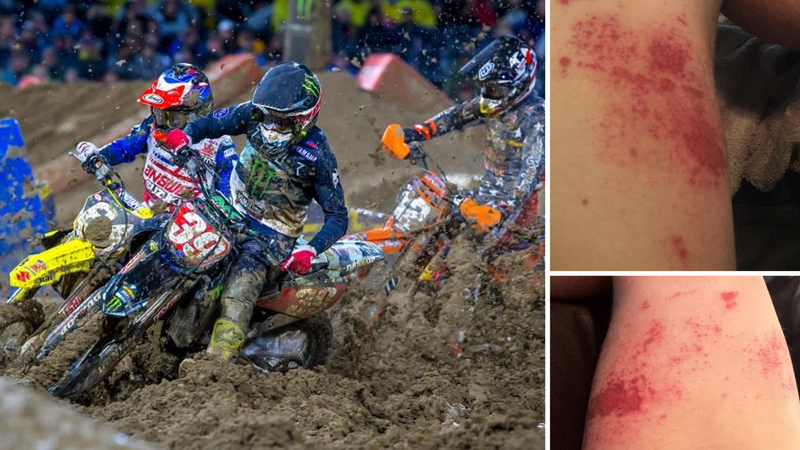 Roczen posted about it on Instagram the next day, and more riders jumped in to share their rash photos soon after the race weekend, saying it had to do with the chemicals used to dry the track. The photos of the rashes range from “Ouch” to downright gross, and the ones of the bikes aren’t much better. Some people, like 450SX rider Vann Martin, said they can’t even get relief from the burns in the shower. Supercross and its production company, Feld Entertainment, responded to the claims on Tuesday, saying the process used to dry the track over the weekend has been used safely “for decades” in order to reduce risk for drivers when a track gets watered down as badly as it did in San Diego. The process involves a mixture of sand and the lime, which, according to Feld, might not have reacted as it was supposed to due to the sheer amount of water on track. The company said it’s currently reaching out to everyone who raced on Saturday to “assess the extent of the impact, ensure their welfare and get them back on their bikes racing.” It’s also reviewing its process to deal with a flooded track in order to prevent this from happening again, Feld said. Prior to the qualifying rounds and main events, [the track crew] removed the protective tarp and applied a drying agent, a lime and sand mixture, to treat two areas on the track to try and remove moisture from the dirt. [...] It appears that the unprecedented amount of rain on Saturday prevented the lime from mixing with the soil as usual. This resulted in splashing of the riders and their bikes, which may have caused skin irritation to some riders and damage to their bikes. “AMA staff is monitoring the situation and working directly with Feld Entertainment as its representatives contact individual riders to assess the extent of the impact,” Massey said.